16 Apr Congratulations Michelle Young, M.S, CCC-SLP! 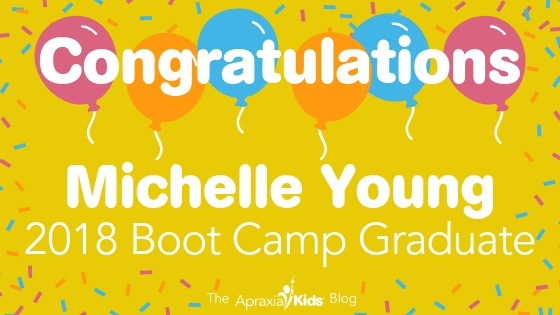 Congratulations to Michelle Young, M.S., CCC-SLP, for graduating from the Apraxia Kids Intensive Training Institute (Apraxia Boot Camp)! Michelle received her master’s degree in Communication Disorders from the University of Texas at Dallas in 2007. She has a background working in private practice, public schools, outpatient services and home health services. In 2015, she opened her private practice, Northeast Speech Pathology, to allow her to focus her clinical skills on partnering with families as they journey through their child’s communication challenges. She has a special interest in CAS, particularly helping nonverbal children learn to verbally communicate to the best of their abilities. Michelle is very passionate about treating the ‘whole child’- supporting emotional regulation, attention, and the child’s ability to participate in treatment sessions, while supporting family involvement throughout the treatment process. She often says, “I tell parents, ‘I’m asking your child to do the most difficult thing in his/her life….’ I don’t take that lightly! I have a responsibility to keep learning, asking questions, and growing because parents have entrusted me with their most precious gift and I have a responsibility to change their lives!” Michelle enjoys camping with her husband and kiddos on the weekend and traveling to new places! Michelle: The way I think about CAS has evolved significantly and continues to evolve daily as I continue to implement the knowledge and skills I have gained from Boot Camp. I feel more confident in differential diagnosis, developing an appropriate treatment plan, and then keeping therapy fun and exciting for the child while implementing apraxia-based strategies into my sessions. Michelle: I feel so privileged to have attended Boot Camp alongside some of the best SLPs in the country. Now I have a network of fellow-minded teammates across the US that are professional resources for one another and have become true friends! Michelle: I am part of the Houston Walk for Apraxia planning team, specifically over sponsorship and in-kind donations. I serve as a local resource for area SLPs in my own clinic, as well as, surrounding school districts helping SLPs navigate through CAS evaluation and treatment. Michelle: Do it! As SLPs, we are all on this journey together. The more we learn, the better we do. This learning opportunity will change your understanding and ability to assess and treat CAS. Who benefits even more? The precious children we treat every day! It’s a win-win! Do it!